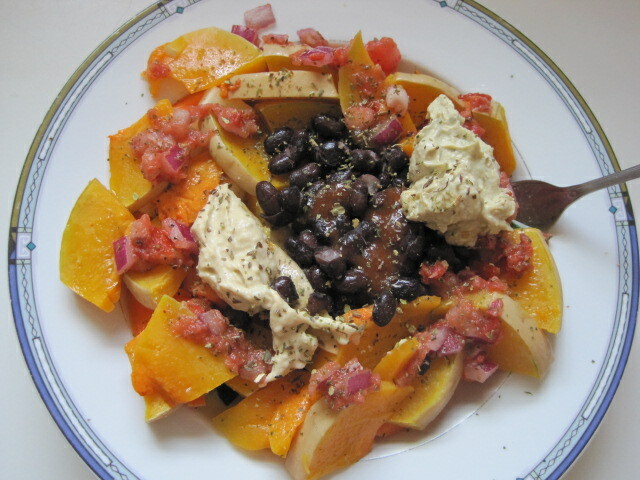 About 2 months ago, I started to experiment with a high-raw diet. 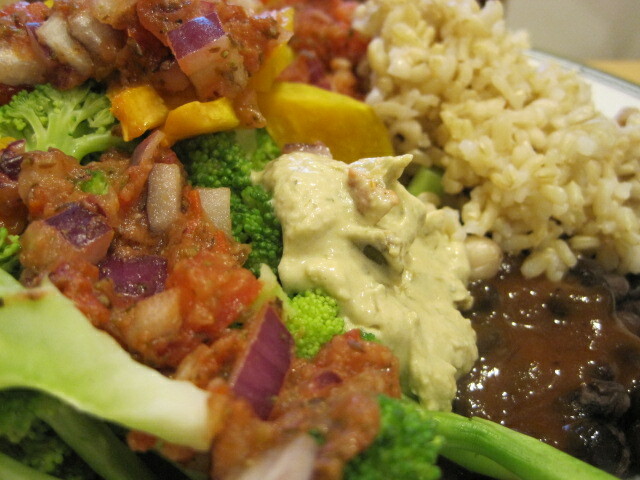 Most of my meals from that period were undocumented because I had not yet started this blog. 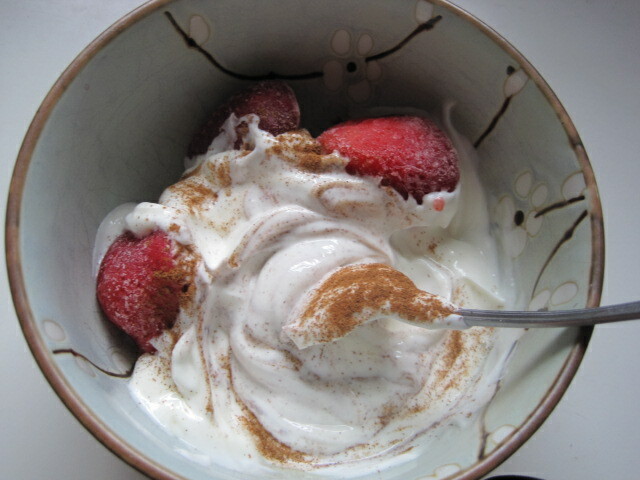 But if you look at my earliest posts, you would find that most of them involved lots of hearty salads, overnight oats, and raw fruit. 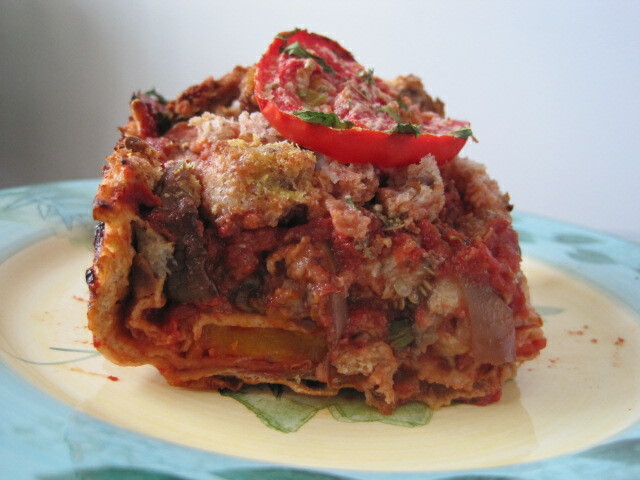 Lately, I’ve been reincorporating more cooked foods into my meals, from eggplant lasagna to roasted stuffed peppers. I think my body has really missed good, cooked food! Why? 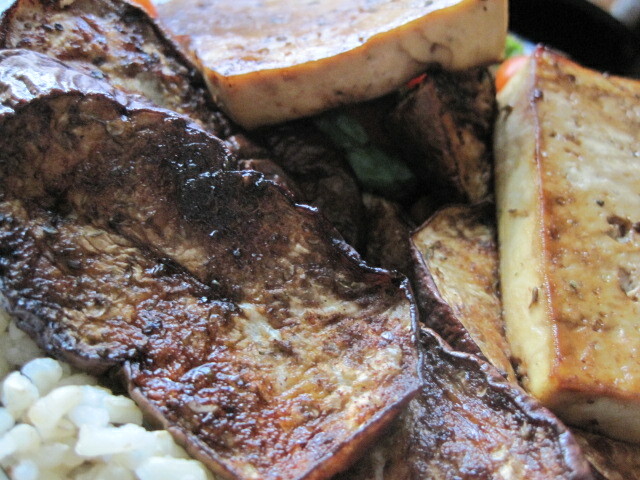 It’s not that raw foods made me feel deprived or unsatisfied; in fact, it was quite the opposite. 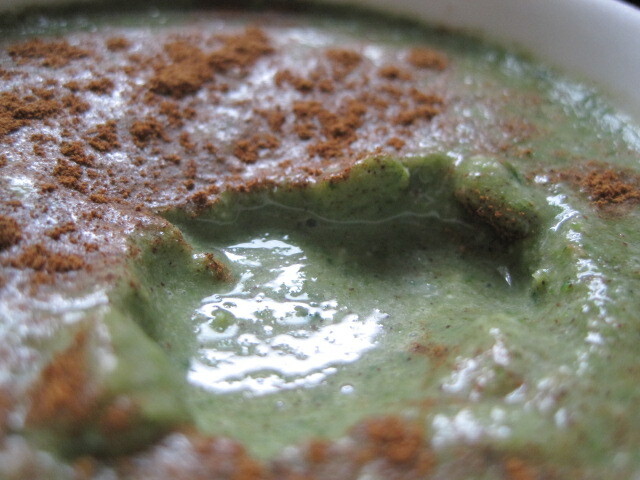 I think my biggest problem was that while raw foods are at their most “natural” state (i.e. still retaining their enzymes), oftentimes eating them would leave me feeling bloated and puffy. Cooked foods, while more broken down, are a lot easier to digest. Some people fare very well on a completely raw or high-raw diet; for others like me, this is not the best choice. Each person eats differently to feel (and look) his/her best. Anyway, I guess I just want to say this: only through experimentation and experience, not through following trends or reading blogs, can each person find his/her happy medium. Reading Heather‘s post on what eating style works for her got me thinking. For now, I can stand firmly behind my decision to become a vegetarian. That one’s pretty much for sure. Being 100% vegan? 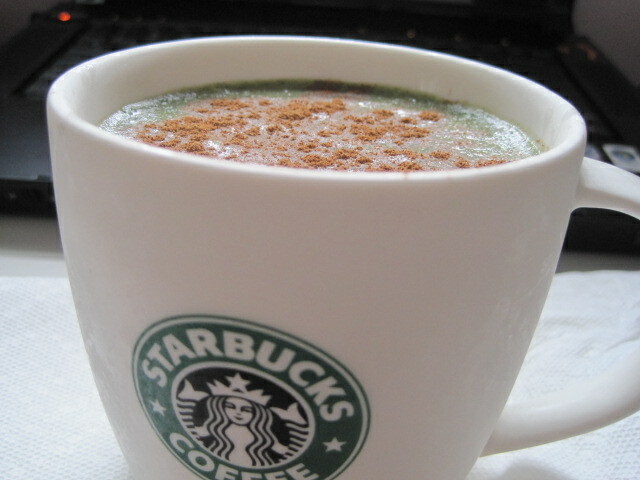 Eh, I’m still playing around with that (recently I’ve been about 75% dairy- and egg-free). I also haven’t quite figured out the right balance of carbs, fat, and protein that works best for my body. But these past few meals have taught to me something in terms of the “doneness” of my food, that a plate with variety–some raw and some cooked–is my happy medium. The proof is in the… bowl? 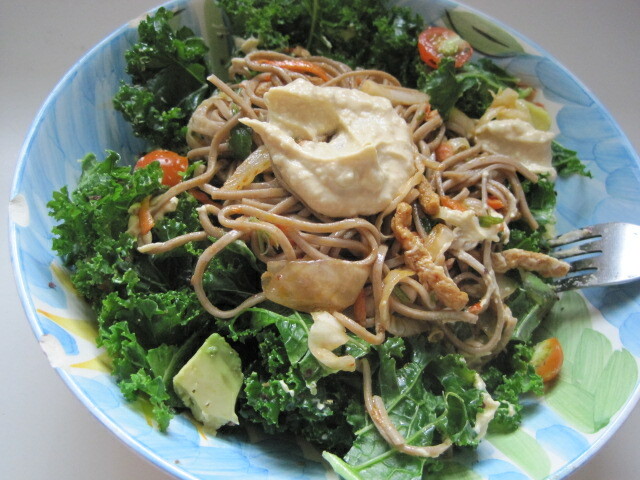 Yesterday’s lunch: leftover soba noodles over a massaged kale salad (kale, grape tomatoes, avocado, olive oil), with a dollop of hummus. 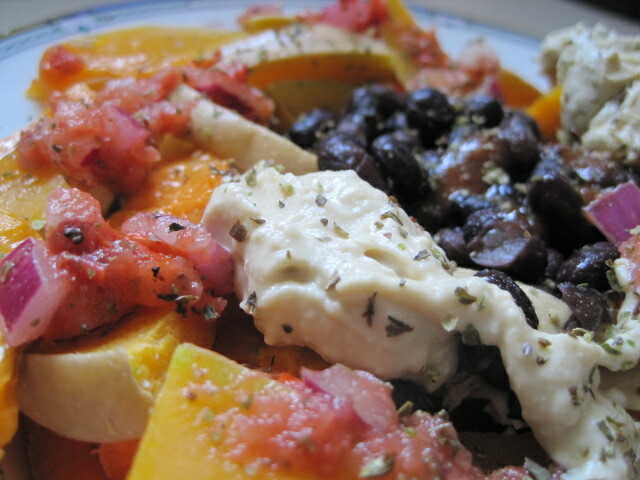 Dinner last night involved me cutting open our garden’s first butternut squash ever! 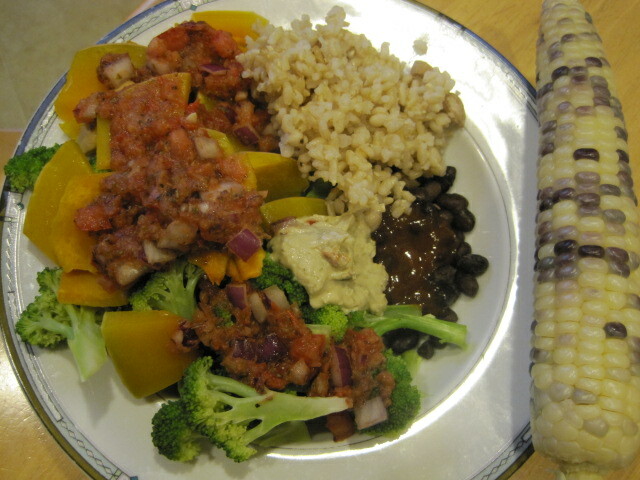 Steamed broccoli and butternut squash with homemade pico de gallo, black beans with BBQ sauce, brown rice, scoop of hummus, and corn (it was not sweet corn! eeek). 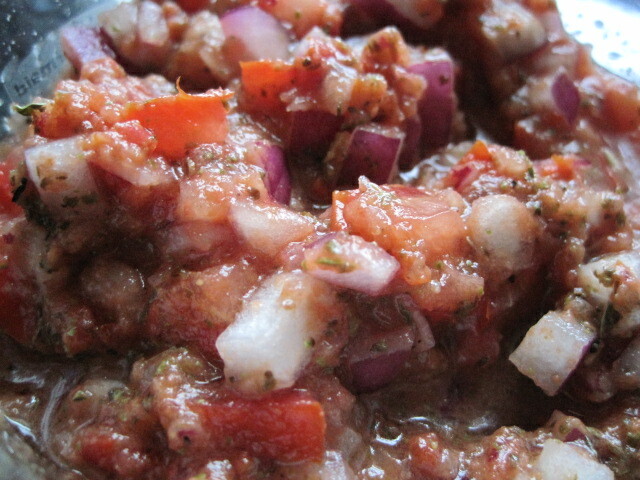 Mince the tomato and onion. 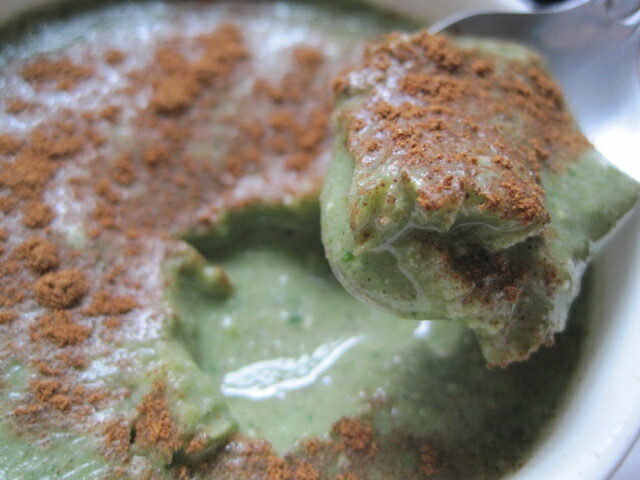 Lightly process all in ingredients in a blender to keep the chunky texture. Adjust to your spice level with other ingredients, such as jalapeños, if desired. Enjoy! 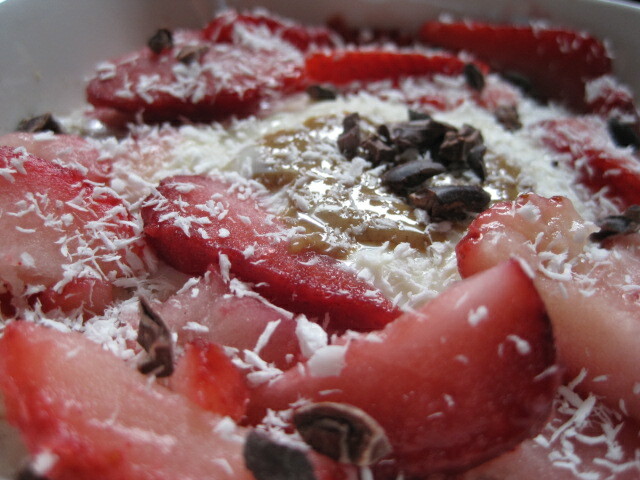 1.5 hours and a shower later, breakfast: Strawberry Shortcake overnight oats. 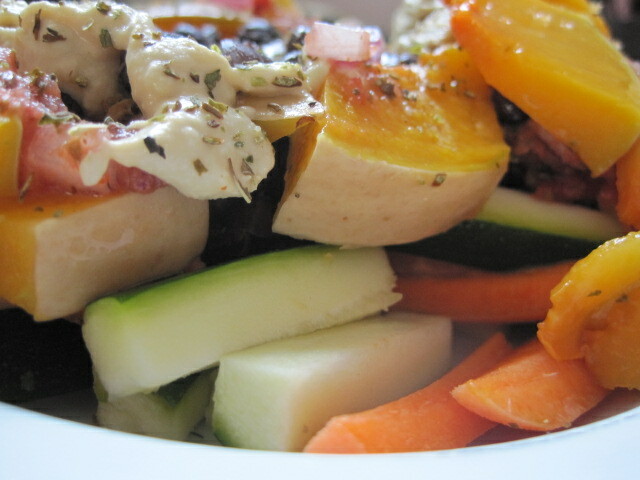 all on a “bed” of carrot and zucchini sticks. 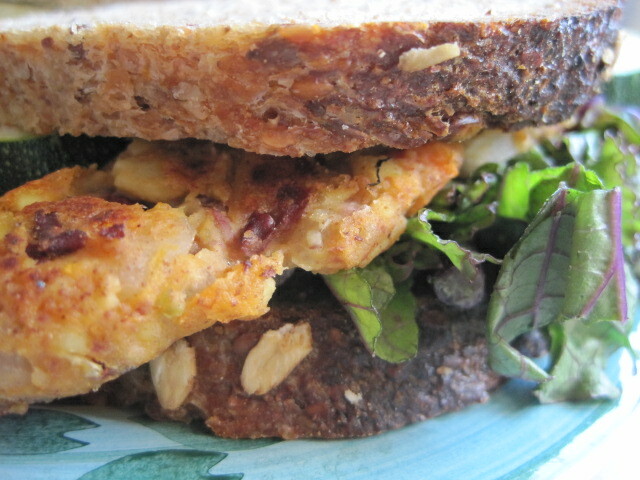 Along with 2 yummy slices of whole grain bread (not pictured). 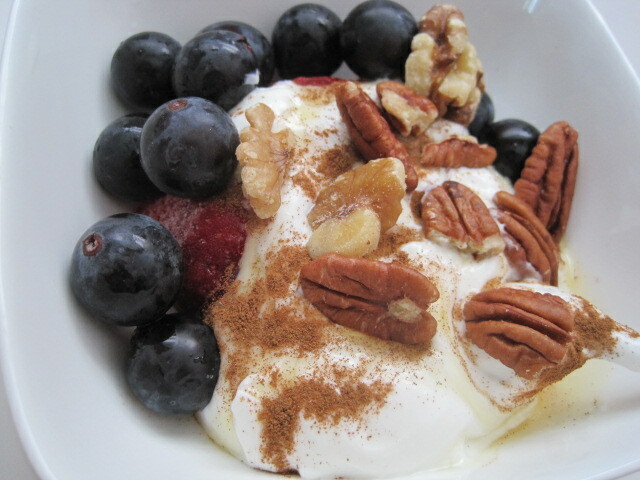 Snackie highlight: plain Greek yogurt with agave, cinnamon, concord grapes, frozen strawberries, and a handful of pecans+walnuts. 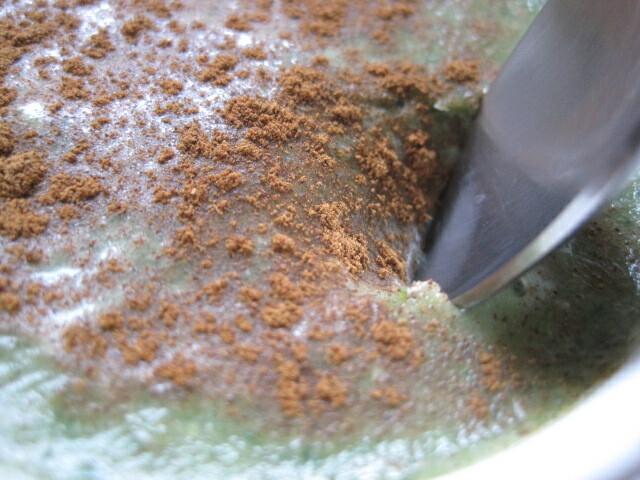 and later, a Chocolate Coconut Chew Larabar (frozen of course). No picture because I was too eager to dig in. Dinner tonight included lots of roasting! 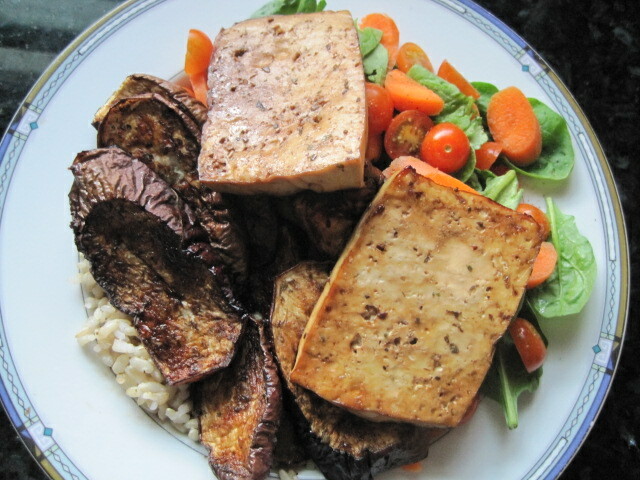 BBQ balsamic roasted eggplant and classic baked tofu, brown rice, side salad of spinach, carrots, and grape tomatoes. P.S. If you’re reading this from Google Reader, come check out the site! 😀 I put up a new Recipes Index in the top menu and also installed some recipes in the form of drop-down menus! 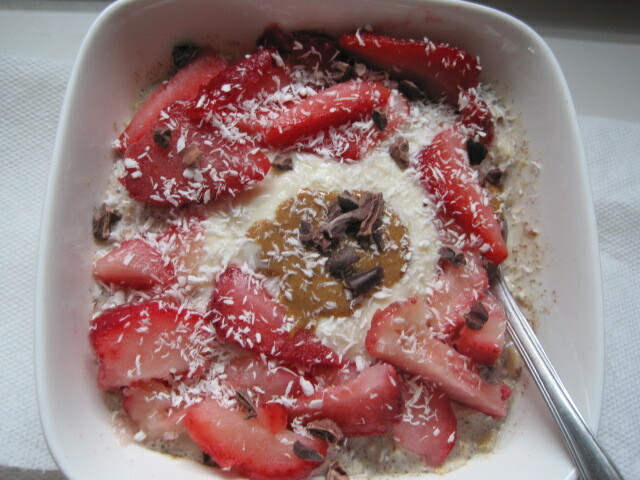 It’s still a work in progress, but I got some of the major recipes up, including overnight oats like I promised. Recipes from this post can also be found there. Have a wonderful weekend! Remember to make your stomach happy, too.